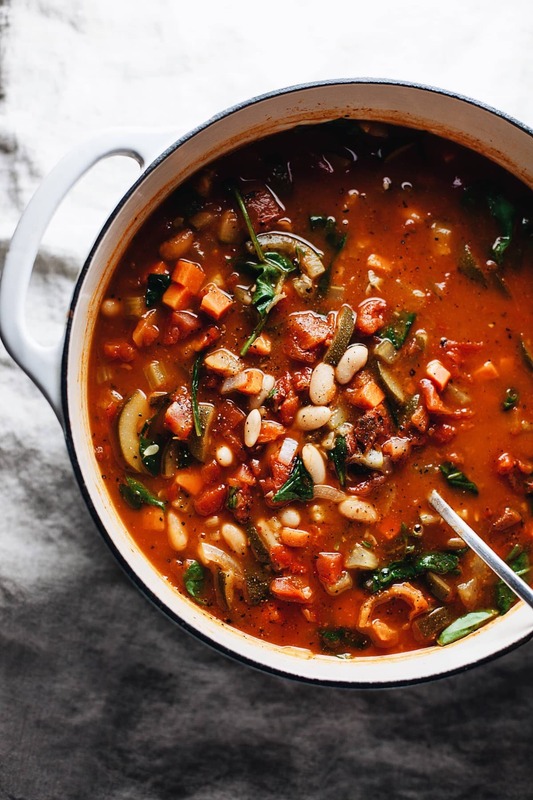 Tuscan White Bean Soup with vegetables – The easiest, most flavorful soup recipe. 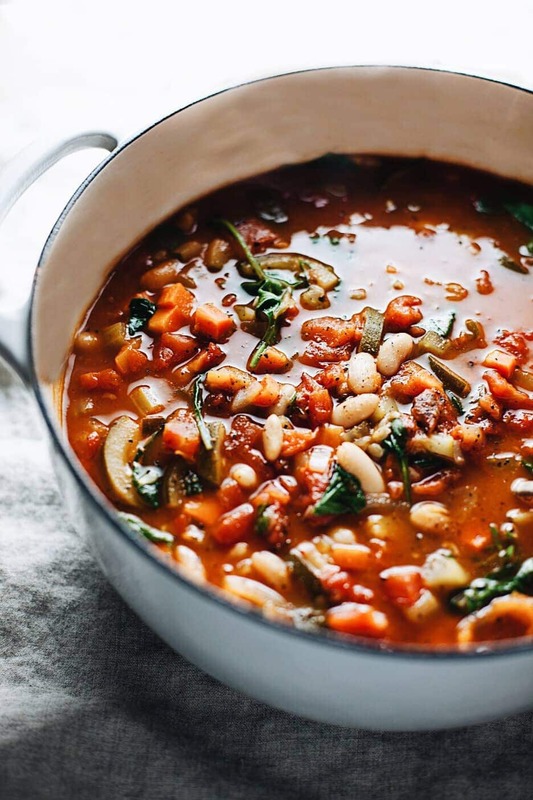 Made with sautéed vegetables, tomatoes, white beans, in a hearty tomato & vegetable broth! 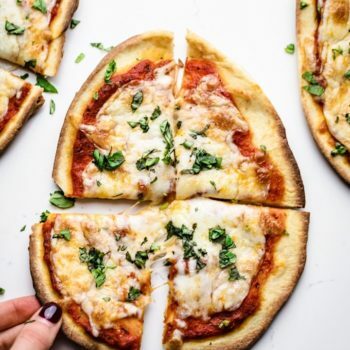 Perfect for a healthy dinner or lunch – make this in a regular pot or instant pot/slow cooker. This Tuscan White Beans Soup is one of my favorites! 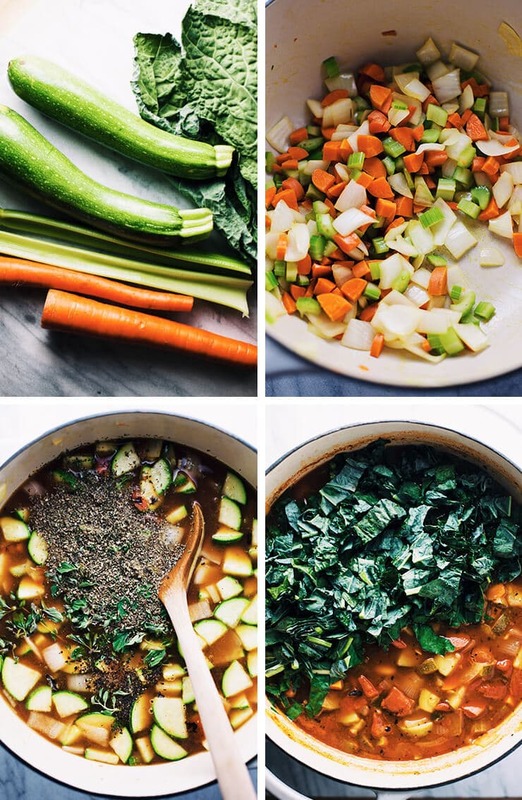 It’s the kind of recipe that has everything but the kitchen sink in it – but that’s what I love about vegetable soups. This is a recipe Drew and I found ourselves making again and again. 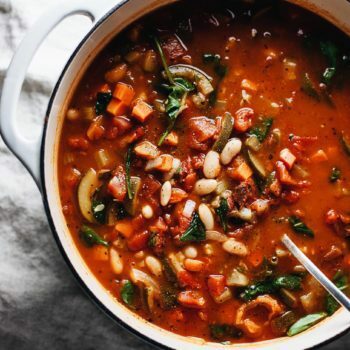 This soup has tons of Italian herb flavor, is loaded with healthy vegetables, and satisfying protein-filled white beans. 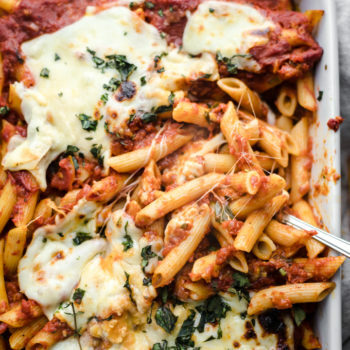 A one pot recipe, with one hour to make, and simply delicious results! Saute chopped onions, celery, and carrots with olive oil for 4-5 minutes until vegetables are soft. Add minced garlic and chopped zucchini – saute for 3 minutes. Then add diced tomatoes, tomato paste, vegetable broth, and all of herbs + salt & pepper. Simmer for 30 minutes. Stir in cannellini beans and chopped kale, turn burner off and let sit for 5 minutes. This recipe is super easy to make in an instant pot or slow cooker. Place all of ingredients to pot (except kale) for slow cooker set for 2 hours on high or 3 to 5 hours on low. Pressure cooker set to 40 minutes on high – stir in kale at very end before serving. If you don’t have kale or aren’t a fan of it you can swap for spinach. I’ve made this recipe many times with spinach and love it! If you are not a fan of leafy greens you can also leave them out. Season with fresh herbs – If you do not have fresh herbs dried work as well. You can also use a store-bought Italian seasoning blend to make it easier. Use high quality vegetable broth for more depth of flavor. Store your vegetable soup in a sealed container in the refrigerator for 3-5 days or freeze. This is a recipe my family and I have truly enjoyed and we all find ourselves making it often. If you’re a fan of vegetable soup like myself, you will love this flavorful, hearty recipe. A quick and healthy, one pot dinner that takes less than an hour to make and is full of delicious Italian flavor. The easiest, most flavorful soup recipe. In a large pot or dutch oven on medium heat, saute in olive oil onion, carrots, celery, and a little salt for 4-5 minutes. Add garlic and zucchini, cook for 3 minutes. Stir often for both times to avoid burning. Add to pot diced tomatoes, tomato paste, vegetable broth, and all of seasonings. On low-medium heat, cover and let soup simmer for 30 minutes - stir occasionally. Add cannellini beans and cook for 5 additional minutes. Turn burner off and stir in kale leaves. If you don't have kale or aren't a fan of it you can swap kale for spinach. Season with fresh herbs - If you do not have fresh herbs dried work as well. You can also use a store-bought Italian seasoning blend to make it easier. I am always looking for great soup recipes and this recipe is easy to make and packed with wonderful flavor. 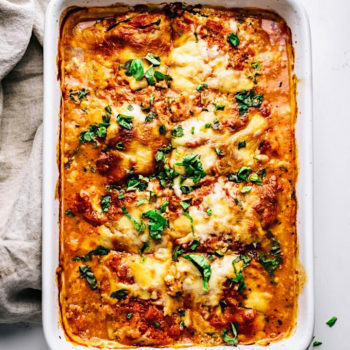 I doubled this recipe since I was making it for the first time for family and friends and no one could resist a second portion. The icing on the cake (so to speak) was freshly grated parmesan reggiano. Seriously delicious and healthy. Bon Appetit! Thanks Bethany for one I will add to my collection. I’m so glad you enjoyed it 🙂 It’s one of my favorites!! When you say 2 cups of spinach do you mean 16 oz or 2 cups filled with spinach. The difference is a lot! Thanks! Just 2 normal cups, I usually eye-ball size it by 2 handfuls. 2 cups is just around the amount I use 🙂 Hope that helps! Made this recipe 3 times – so easy and such a hearty soup. 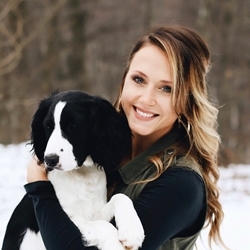 It’s one of our favorites!! Yay! 🙂 SO glad ya like it. Made this 3 times! such a hearty easy soup to make – one of our favorites!! currently making this soup for a second week in a row because i loved it so much!!! thanks for the wonderful recipe. It’s one I repeat often 🙂 I’m so glad you like it!